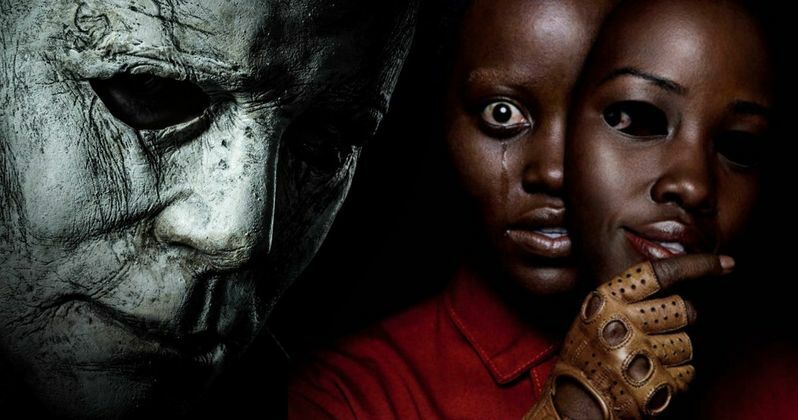 A very intriguing new theory about Us has surfaced online that would directly connect director Jordan Peele's latest to Halloween. Peele asserted himself quickly as a welcome and innovative voice in modern horror with his directorial debut Get Out. Last week, he continued his hot streak with Us, which has been killing it at the box office. But given the nature of the new movie, it's also inspired a great deal of theorizing and, in this case, we have someone who thinks Michael Myers belongs in the same universe as Us. Warning: major spoilers ahead for Us. Seriously, final warning. What we come to learn in Us is that there are thousands of miles of tunnels underneath the United States that house a group of people known as "The Tethered." These are clones who were created by a mysterious government body in an attempt to control the population. That didn't work out, so these clones were abandoned in these tunnels and were left there for generations until they eventually lead a murderous uprising. That's the short of it. The Tethered share a soul with their human counterparts on the surface. That's an important thing to note as it pertains to this theory. The idea here is that Michael Myers is actually a Tethered and that he swapped places with his human counterpart, much like Adelaide and Red did in Us. Here's how Reddit user Kanti_BlackWings, who recently posted the theory, explains it. "In 1963, Michael Myers came home from trick r treating, went into the kitchen grabbed a huge butcher knife and then proceeded upstairs to stab his older sister Judith to death...During the kill, he made sure to put on a mask (as he would later in life as an escaped mental patient/serial killer) and did not speak a word...In fact, Michael never speaks...the most we get from him are grunts, but no discernible language...Much like the Tethered." Indeed, at first glance, Michael Myers' behavior is very Tethered-esque. It's explained that The Tethered have existed for decades. It's never established for quite how long, so it's conceivable that it could date back as far as 1963. Why not? Kanti_BlackWings goes into further detail, that is equally convincing and problematic. "My theory is that if one were to interlink the plots of the two films, Michael got replaced by his clone at some point in the night just before the prologue of Halloween... The murderous tendencies, the silence, and the random 'evilness' of it all fits the bill...Even better, the introduction to US mentions thousands and thousands of miles of unused tunnels with no known purpose...Well, in Halloween Resurrection, it is revealed that there is a huge catacomb-like tunnel system running directly underneath the Myers house and that it links to the home's basement... That means, that the real Michael Myers got swapped like Adelaide and has been trapped for almost 60 years among people he can't communicate with and who are envious of the former life he used to have..."
The most recent Halloween was a total retcon and threw out every sequel beyond John Carpenter's original. So this bit about Resurrection may not hold water. Then again, there's no reason those tunnels below the Myers' residence couldn't exist in the new continuity as well. If they do, that makes this theory all the more compelling. It's also worth noting that Jordan Peele specifically mentioned Halloween several times in interviews as an influence for Us. There are also visual cues in the movie that speak to it, such as the red jumpsuits that resemble the one worn by Michael Myers, and even the use of masks. That could all just be for the sake of homage, and that's likely the case, but it's still fascinating to consider. The theory includes additional little details, like Dr. Loomis using a box of matches from a company called "Rabbit in Red" to track Michael Myers. Rabbits and red both play a huge part in Us. Also, and not for nothing, both Us and the most recent Halloween were released by Universal. To read the theory in its entirety, head on over to Reddit.